A gorgeous male Chestnut-sided Warbler at Sam Smith Park. Rob and I started taking two weeks of vacation time in May a few years back so we could enjoy the bird migration to its fullest. Even with our trip to the Pelee/Rondeau area and our Ballie Bird-a-thon, we weren't done yet. We also visited the Toronto Islands with friends, and that's where I saw my first Mourning Warbler and we all enjoyed excellent viewing of a juvenile Bald Eagle. We took in "Ontario Swift Watch" one evening with friends, because watching a Chimney Swift roost is an amazing experience. 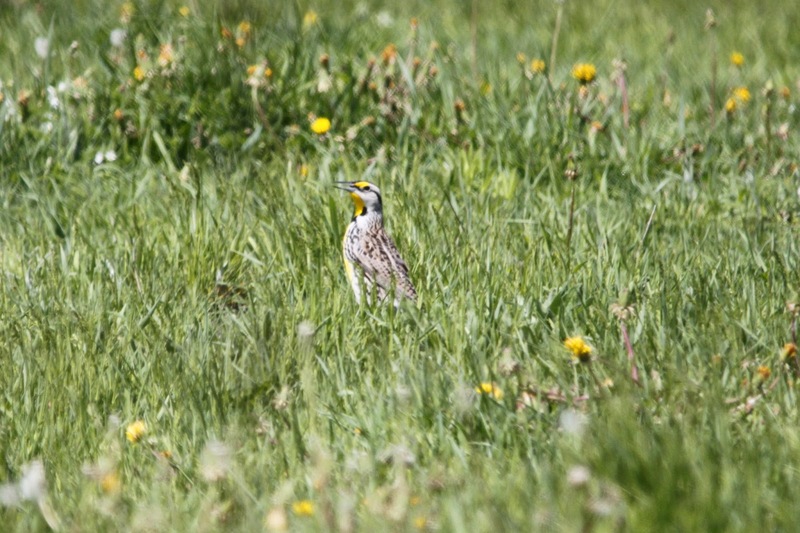 We took an early morning trip to the Carden Plain area, where we got to see Eastern Meadowlarks, Bobolinks and Snipes. And to finish it off, we took in the Colonel Samuel Smith, "Spring Birding Festival", which is now in it's fourth year. 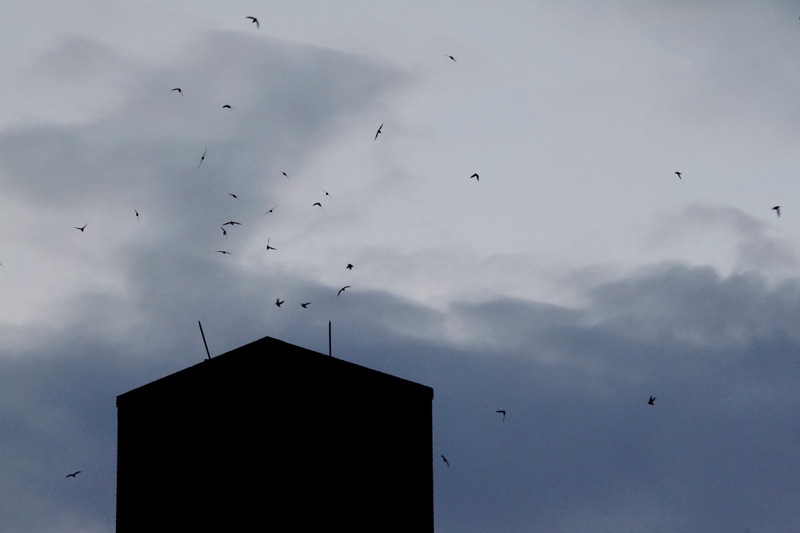 Watching hundreds of Chimney Swifts go in for their nightly roost is a magical experience. 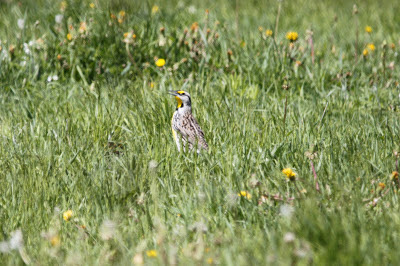 Eastern Meadowlark at Carden Plain. 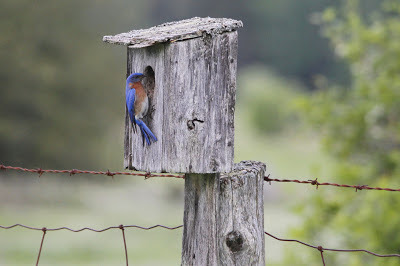 We were thrilled to see 6 nesting pairs of Eastern Bluebirds in the Carden Plain area. It was a feather-filled, fun two weeks!! 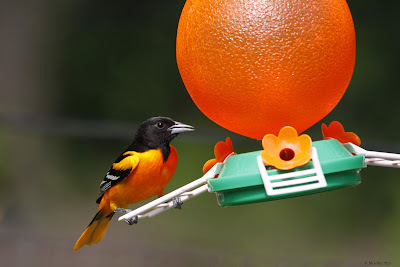 It's almost time for me to hang up my bins for a couple months, as I enjoy most of my birding from the comfort of our own backyard over the summer, and with Baltimore Orioles hanging out in our yard all summer, who can blame me. One of our summer guests, a male Baltimore Oriole. Sounds like a perfect vacation for you!